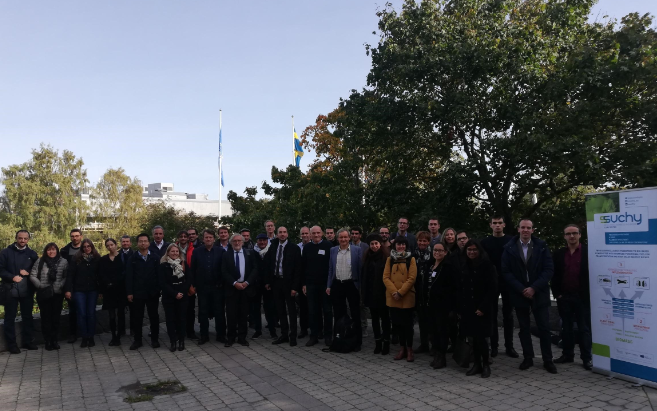 One year after the project launch, the second bi-annual project meeting was held at Stockholm University, on October 4 and 5. This two-day meeting was the opportunity for the consortium to take stock of his first year of work, which has allowed the advancement of the most upstream activities in the value chain dedicated to the development of bio-based composites products: production, harvest and exploitation of raw material. The first year of work of SSUCHY Project included the production, harvest and exploitation of raw material for the development of bio-based composites products. The production of hemp and its transformation into textile preforms and composite materials has made significant progress. Regarding the production of plants, the varieties have been selected and the cultivation practices optimized thanks to the previous knowledge collected in the MULTIHEMP European project. The beginning of September 2018 was marked by the end of the harvests, providing the SSUCHY consortium a plant material whose history is well-known and its traceability assured. It should be noted that, for the first time, results demonstrating mechanical properties equal to or greater than those obtained with the most efficient flax reinforcements on the market have been collected at the scale of thermosetting matrix composite. In addition, the activities carried out by the SSUCHY consortium led to a 100% bio-based polyepoxide matrix, at the laboratory scale, synthesized from wood and plant derived synthons and in particular from lignin, combining high mechanical and fire resistance properties.